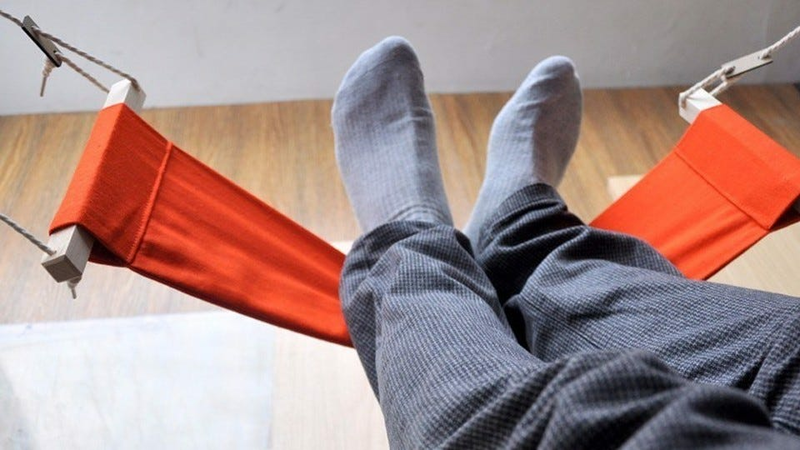 Footrests aren’t just just for taking a load off and putting your tired feet up for a spell (although you and your feet deserve a break), they offer ergonomic and health benefits to keep you happy and productive. Maybe your sole experience with using any kind of footrest is the more traditional kind, like putting your feet up on an ottoman or a fold-out rest on a recliner. If so, you probably just associate using a footrest with unwinding at the end of the day and not with sitting at your desk at the office. Footrests are for more than lazing about, they’re healthy for your legs and back. Alleviate pressure on your lower back. Encourage lower limb movement (especially with rocking footrests) that improves circulation. 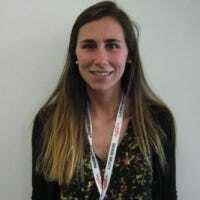 Encourage good posture by keeping your legs level and your body from leaning forward. So while you might have taken a peek at this article just because you like the idea of putting your feet up at work, the reality is a good footrest can be just as important to your office setup as a comfortable chair and proper lighting. To help you in your pursuit of happy feet and a healthy office, we’ve rounded up some options for a variety of budgets and needs. For those who want a conventional footrest that adjusts to the height of your preference, whether that’s slightly tilted near the floor or sitting tall like a foot stool, the HomeTown Market Adjustable Footrest is for you. This footrest truly won’t win any beauty contests—it’s a piece of metal and plastic office machinery if we’ve ever seen one—but it’s incredibly sturdy, highly adjustable, and unlike other options on our list it can function as both a slightly footrest you use with a too-tall office chair all the way up to a platform you can rest your calves on like a tall ottoman. If you’re looking for a footrest that’s both comfy and economical, whether your shoes are on or off, the foam Rest My Sole Footrest Cushion is a great choice. The design of the footrest is rather clever and allows for two totally different positions. You can place the Rest My Sole with the base down, in which case it functions like a little speed bump you passively rest your feet on. Or, if you’re looking for a more active experience, you can flip it over with the curved side down, like a little teeter totter, to increase your lower body circulation by rocking your feet back and forth. Worried about dirtying it up? The microfiber cover is removable and machine washable, so even if you get a little summer mud or winter slush on it, you can always toss it in with your next load of laundry. The cushion itself is made of high-density foam (like memory foam mattresses) and will retain its shape despite your delight in smooshing it. 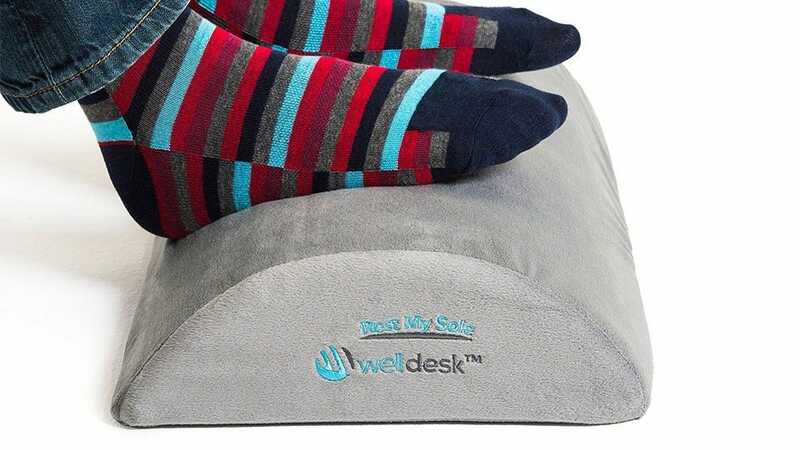 If the Rest My Sole footrest’s ability to keep your blood pumping with the rocking position wasn’t enough, then look no further than the Webble: a veritable theme park for fidgety feet. The Webble Footrest is certainly not your ordinary footrest. 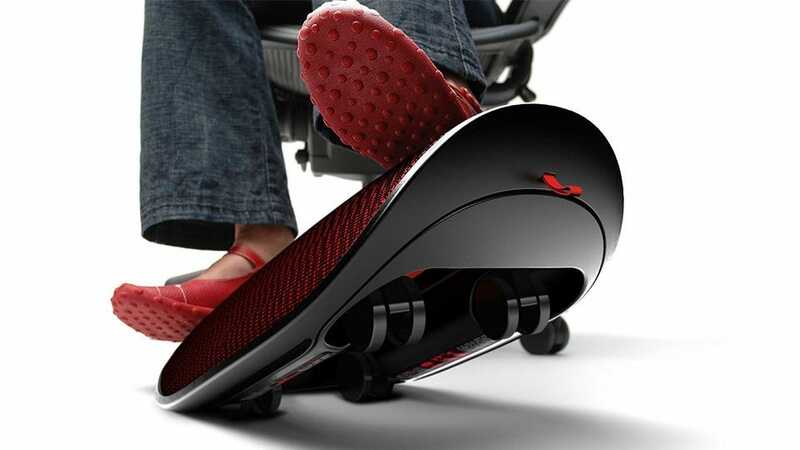 The body of the footrest looks somewhat like a combination of a bean and a Pringle chip in a skateboard-like package. You can rest your feet on the soft mesh top of the shape to use it passively, or you can position your feet more firmly in the center or even on the edges to rock and glide the footrest on the small wheels beneath the curved shape. 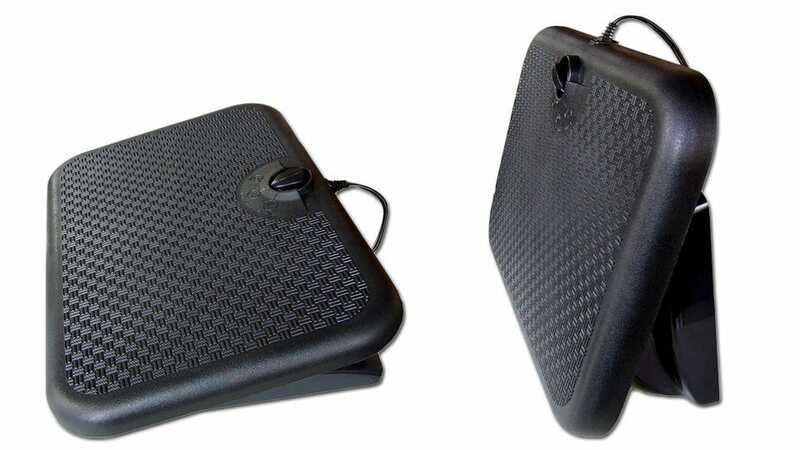 The wheels on the bottom of the Webble footrest are a big (albeit well concealed) part of the design and why this footrest is perfect for active sitting. By sliding the footrest back and forth or in a circular motion you can isolate different parts of your lower body and relieve pressure on your lower back, hips, and legs. Need to see it in action? There’s a video for that. As much as people love the design, however, be forewarned that it can be a little noisy on hard surfaces. If you share an office space you might want to consider throwing a small rug under your desk to cut down on the noise of you happily surfing your feet around. 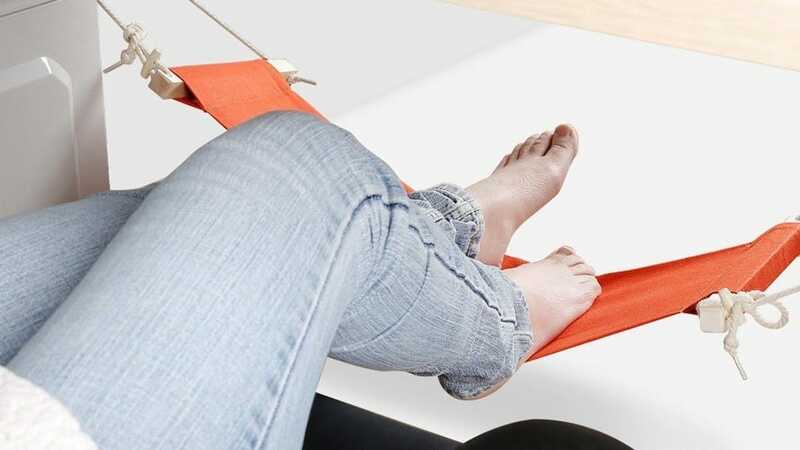 Despite the obvious downside to the design (you have to affix it to the underside of your desk somehow either by using their supplied attachment clips or attaching it yourself in some manner), there’s just something novel and relaxing about putting your feet up on a hammock beneath your desk. Better yet, if you’re particularly sold on the design and want to take it home with you or on the road, unlike most footrests this one folds up tight and packs light. Whether it’s the dead of winter or the middle of summer, many people find their offices are never warm enough. Toasty Toes Heated Foot Warmer not only elevates your feet to perform the traditional function of a footrest, but keeps them nice and warm while doing so. It only uses 90 watts of energy so, compared to a full space heater, it’s pretty economical. Further, speaking of space heaters, you can position the Toasty Toes footrest in three positions: flat, slightly elevated, and standing upright to serve as a small but effective under desk heater. 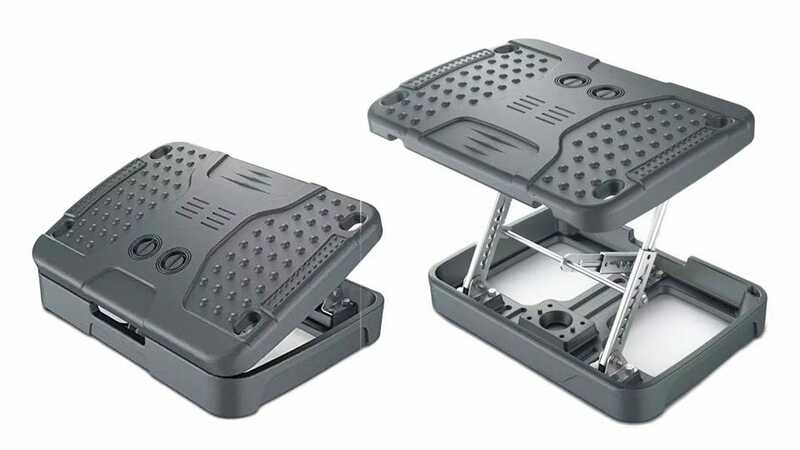 Among heated footrests, you’ll be hard pressed to find a more versatile and beloved product—owners of freezing feet everywhere sing its praises. Footrests don’t usually come to mind when you’re using a standing desk, but just because you’re not sitting anymore doesn’t mean you don’t need to be thinking about movement, ergonomics, and promoting good circulation. 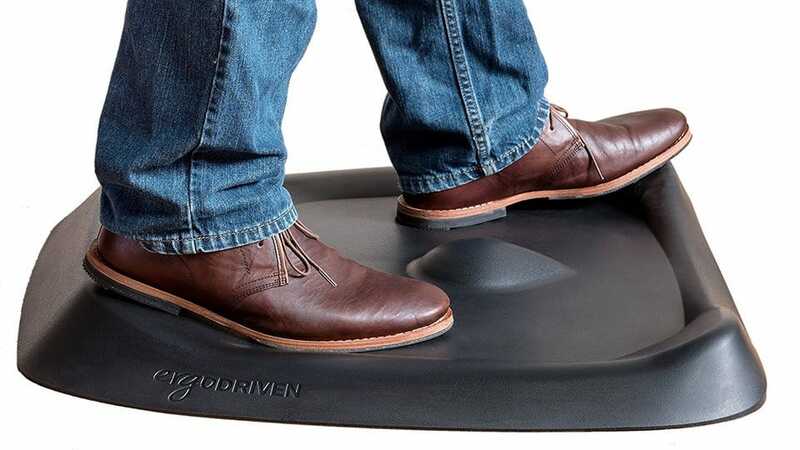 The Topo Standing Mat by Ergodriven provides cushioning for pressure relief, while also encouraging movement while standing thanks to the varied “terrain” of the mat. The sidewalls are slanted, the inner portion of the mat features a raised bump to angle your foot on (and, if barefoot, to massage it), and overall the configuration gives you a wide variety of ways to stand, relieving pressure and introducing new stances to prevent stiffness. Why limit yourself to a plain flat anti-fatigue mat when you can have this?